We all know that the “Society” want to show us the perfect look of a Human, how you need to look like, how you need to act and all this stuff. In the past weeks i start reading a few blogs and article about all this. Every single article has the same “beauty things” which a human need to have to be perfect for the “Society”. We shouldnt define our beauty about a scala that the Society seems to show us to look perfect, but when we are honest theres people they are healthy Skinny thats totally okay but theres also people who deals with Anorexia just to be Skinny and look like the perfect Woman or Men, to have Anorexia is a really bad thing that in the past year more and more Girls/Boys need to deal with they grow up in a world wheres the important point to be Skinny and Beautiful. They dont have to choice to see from themself how beautiful they actually are and that they dont need to change themself for anyone, no theres the Social “Society Perfect” and just this seems to important. To have a Jeans size 0 seems more important as to have a wonderfull time in Highschool with friends, or going out for a Dinner with Someone. More and more people are falling in a black hole cause they want to be accept from thoose other “beautiful called” people and do almost everything just be with them, even then when the last Stop over the Anorexia is the Dead. The Numbers of dead people who dealed with Anorexia are between 10-15% of the entire mankind, and every year theres more people who think Anorexia is the last point to loose weight just to be perfect. The exact number of people worldwide whos suffer against or with Anorexia are not 100 % right cause not all people are on a List but News Sites are saying that every 10. person on the world is suffering with or against Anorexia. A number that should scare us all, or it should scares us all. But we shouldnt forget that not just the ( Eating disorder ) is something that people need to deal with no theres many more ways how people go their ways to be “perfect” or sometimes how they fai. With fail i mean the Suicide who ends always with dead or the Self-harm. People who seems to think they have never any chance to look perfect or accept by people how they look like, need to find a way to deal with these many emotions whats i this moment is in them, they try to find something to let all this out and Cutting are sometime the “easiest way”. I Dont wanna say its good no not at all who is a ready of my Blog knows im also dealing with Self-Harm. I Just want to make clear here that we need to be “society perfect” we are already perfect in our own way. The Numbers of people who commit suicide climb in the past years and also thoose from people who Self-Harm. Its been said that every 5 mins someone in the world commit Suicide, these numbers are not 100% then sadly some people are never found or just days/weeks or years later. I dont wanna say that everyone who commit suicide did this just to be perfect, no theres mayn other reasons, i just wanna show here some numbers of these sad ways. 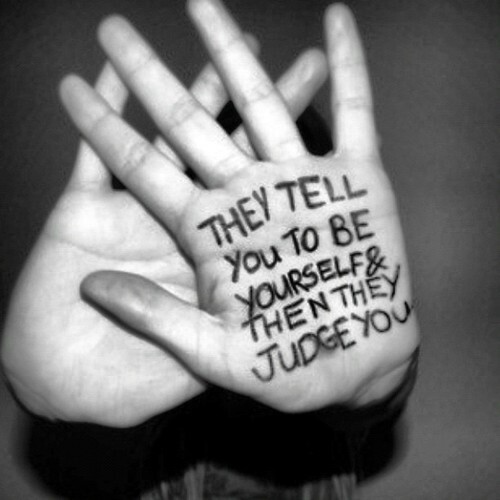 Sadly when you dont look the “society perfect” people think that they could start bulling you just about the fact your seems to be not perfect but you ARE. 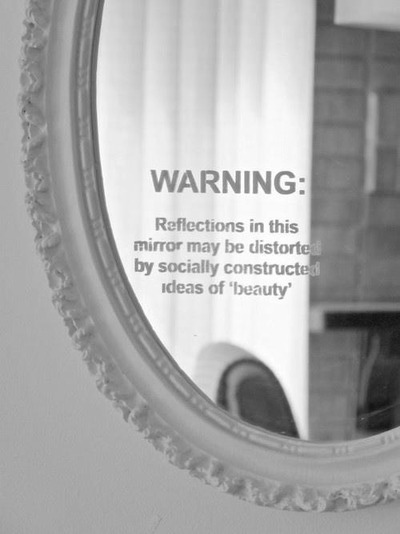 I think the Society would never Change their view about being and look perfect in their way, but maybe we all can see in the mirror look at us and start to Love what we see and we all dont want to be something or someone else. We are all Beautifull in our own way, we are all diffrent and this is right how weird would the world be when we look all like the same person. These things they diffrent between us all make us to something special, your friends ot people who love you family maybe, they love maybe your own Nose how she look or your bright brown eyes ?. We all get Loved by people around us cause they see us as a perfect human, the society is just a word in a news paper or a word in the Designer Magazins. But we are all better as just a stupid world. So Look in the Mirror and see yourself with a complete diffrent view of yourself,you are perfect trust me :). … At the end i just wanna say i dont want to affect against anyone not the skinny ones or the people who wear the size 0 I just want to show here my side and my View how i think about all this, and this here is just this what i think and need to be said, thats it …. For me the Music is and always will be a very important part in my life. She saved me from so many things and i wouldnt be here when i would never start listen to some special Bands or just Songs. What do you think about concerts and the feeling to stand with 1000 of people in one room, to share the love for a special band, party like it would gave no tomorrow just live every single sec ? How is it for you to go to shows from your favorit Band or Solo Artist. When i talk with a few of my friends they cant understand why im so often at some concerts and why i love it so much. Just the feeling to wait infront of the Hall and to know soon you gonna see you band back on stage to hear their music live, this one of the best feelings i know and love. The Hours to wait in rain, when its cold or sunny it diesnt care, its an awesome feeling. Then when the doors are open and the people can go into the hall, i cant reallydescribe this feeling, m heart start beating faster and faster, when im in in the haal and see the stage, the line up and all this, i feel like i would be home and enjoy every single sec. To be in the front row is one of the best feelings every ou have the chance to get the hand of your idol, you see everyone of the band. Then when the Support Band come on stage the feeling getting bigger and bigger you listen to the music of the support band but my mind is always to that bannd why im actually there, and to know that i gonna see them in less than 1 hour makes me at that moment so unbelivable happy, for me the concerts are an important part of my live obviously the music is also an very important part for me . When the Support Band leaves the stage and the technical dudes set up the line up from your Band you could scream cause you are so happy that you see them so soon my heart and my pulse are unbelievale high i have so much adrenaline in me, and then the music from your band start to begin and you could freak out directly just to listen some tunes gaves me so much that nothing else ever can. Then you see them “your Band/ Your Idol” and in that little moment ou cant really belive that this is really happen right now, you see them just a few meter infront of you, they start singing that songs that helped you alot in the past, you can sing every single word with them, this feeling is unbelievable, i cant really find words for this. You party in this time so much with your friends and the people there as it wouldnt gave a new day. To be there where you really belongs to makes everything so special. Sadly you know that after 1,5 hour everything is done the Band with they concert finished their set list and your sad cause now its done the day where you waited for soo long end then, some people start crying and some people just smilig the whole time, when the bad leave the stage everyone is running to the merch temp where you can buy a memorie of the night and took some picture while and after their show. To leave the hall makes me always sad its really bittersweet. You are thankful for having a amazing night like this one, but at the other site you are extremly sad cause its over and for some bands you need to wait a year sometimes more before you gonna see them back :(. But the memories will always a important part and you have them forever. The most wonderfull thing at concert is the fact to meet so many diffrent people from whole germany and somtimes from other countrys too. It unbelievable from where all the fans arrive just to see their/your Favorit Bands. Some people standing after their concert outside and wait to see maybe the band again and to make some photos and talk a bit some band do this and take some time to spent a bit time with their fans. To take a picture with your Band or just with one of your Favorit members can make you extremly happy :). So what do you think about concerts and going to some ? This can be grow up to a wonderfull thing, that you ve meet new people and start loving them with all your heart and with all your love, you miss them like hell and everything but it can change also into something really bad then, footprints can change into really hurting scrars of getting the feeling of being betrayed. 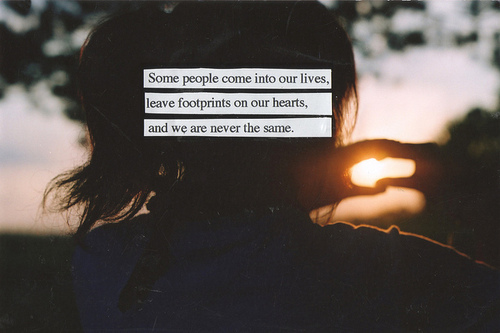 Ive never believed in this that just people can changed your own life in something complete diffrent, i mean when you start think about this, theres actually just people you ve meet. But this year ive learned it could happend, people who leave footprints of your heart, and they change yourself into something complete new, you find reason and start believing in something good. Ive meet a “Band” and trough these Band ive meet so many people in whole Germany, and we have so much in common and thorugh these Girls and Boys ive change myself in so many ways, im still not over my past and maybe i never get over this but these people gave me more strenght in my life and reasons to smile for something. Ive heard a few times about this that Strangers become to something really wonderfull like soulmates, sisters or something else, but ive never had this chance to meet people like this. I just learned how mean people can be, and what they can say and do to yourself and with yourself. But i think the Soceity of 2011/2012 or the next years who are on the way, show us a complete wrong pictures of being Beautiful. I mean with this .. I would never talk to an “Barbie” Girl, i mean with this a girl who looks perfect with all the Make up on and wear just label clothes, that what i mean with “Barbie” girl. I would never to talk to someone like this cause i think these people would ignore a girl like me and i think im not the only one who think the same right know. The Soceity killed the Gene in people to meet new People to being open for something new. When i imagine where i would be right know and who i am right know when ive never gone to this concert at the 11.09.2011. I dont know what happend then ? At one site it scares me a bit, but at the other site it haqppend something wonderfull in my life. People who accept me for that what i be and always gonna be. These Girls and Boys defently leaved footprints at my heart. They become for to people who i really love and happy about, and i never wanna miss these wonderfull people in my life, cause i dont wanna change it. In the last few days i start thinking about a few thing, how my life would be now without them and all this, and im not sure where i would be .. But it would be completly diffrent. The Only advice that i wanna give you, when you found a person who you already see that these person can help you more as some other fight for that , that she or he is stil and always will a part of your life then these people are like diamonds in the world, they shining and being Rare in the world so beware and care. The Other site of leaving footprints on your heart could be, when a realationship starts to break, and this in nothing really good its sad when someone that you told everything from you, who you love and care about step away from being a part of you life and start being and outstanding persone. This is somethin really heartbreaking and leaves scars on your heart where the footprints was. We all are never beware of getting hurt by someone who we thought can trust to, but this happend so often in the life but still this hard part of a life can be a lesson who you can learn from, i mean when you ve lost your best friend in your life yeah this is hard but you ve learn from this and getting stronger out of this, you dont see this directly but after days or maybe weeks you will see, you ve learned from this. Trust me i know from what im talking about. All these situation making us to this what we are right now, so chin up, smile and enjoy the journey of the life.